This article is about the energy drink. For the company, see Red Bull GmbH. For other uses, see Red Bull (disambiguation). Red Bull is an energy drink sold by Red Bull GmbH, an Austrian company created in 1987. Red Bull has the highest market share of any energy drink in the world, with 6.790 billion cans sold in a year (as of 2018[update]). Austrian entrepreneur Dietrich Mateschitz was inspired by an existing energy drink named Krating Daeng, which was first introduced and sold in Thailand by Chaleo Yoovidhya. He took this idea, modified the ingredients to suit the tastes of Westerners, and, in partnership with Chaleo, founded Red Bull GmbH in 1987 in Chakkapong, Thailand. In Thai, daeng means red, and a krating (known in English as a gaur or Indian bison) is a large species of wild bovine native to South Asia. Yoovidhya's heirs own majority stakes in both brands, and they both use the same red bull on yellow sun logo while continuing to market the separate drinks to the respective Thai and Western markets. Red Bull is sold in a tall and slim blue-silver can. Originally only available in a single nondescript flavor and regular or sugar-free formulas, a line of "color editions" with artificial fruit flavors were added to the line beginning in 2013. The Red Bull company slogan is "Red Bull gives you wings". Rather than following a traditional approach to mass marketing, Red Bull has generated awareness and created a 'brand myth' through proprietary extreme sport event series such as Red Bull Cliff Diving World Series, Red Bull Air Race, Red Bull Crashed Ice and stand-out stunts such as the Stratos space diving project. Red Bull's marketing arsenal also includes multiple sports team ownerships (Formula One teams Red Bull Racing and Scuderia Toro Rosso, football clubs RB Leipzig, FC Red Bull Salzburg, FC Liefering, Red Bull Brasil and New York Red Bulls), celebrity endorsements, and music, through its record label Red Bull Records. Energy drinks have been associated with health risks, such as masking the effects of intoxication when consumed with alcohol, and excessive or repeated consumption can lead to cardiac and psychiatric conditions. 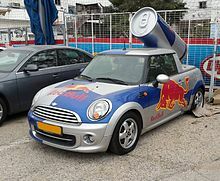 However, the European Food Safety Authority (EFSA) concluded that an adequate consumption of Red Bull and other popular energy drinks is safe and that the amount of caffeine in standard Red Bull cans is unlikely to interact adversely with other typical constituents of energy drinks or with alcohol. Energy drinks have the effects that caffeine and sugar give, but there is no distinct evidence that the wide variety of other ingredients has any effect. 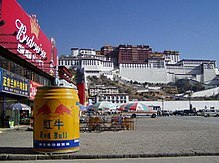 In front of the Potala Palace, Tibet: a model of Red Bull in Chinese version is displayed. In 1976, Chaleo Yoovidhya introduced a drink called Krating Daeng in Thailand, which means "red gaur" in English. It was popular among Thai truck drivers and labourers. While working for German manufacturer Blendax (later acquired by Procter & Gamble) in 1982, Dietrich Mateschitz travelled to Thailand and met Chaleo, owner of T.C. Pharmaceutical. During his visit, Mateschitz discovered that Krating Daeng helped cure his jet lag. In 1984, Mateschitz co-founded Red Bull GmbH with Yoovidhya and turned it into an international brand. Each partner invested US$500,000 of savings to found the company. Yoovidhya and Mateschitz each held a 49 percent share of the new company. They gave the remaining two percent to Yoovidhya's son, Chalerm, but it was agreed that Mateschitz would run the company. The product was launched in Austria in 1987. In Thailand, energy drinks are most popular with blue-collar workers. Red Bull re-positioned the drink as a trendy, upscale drink, first introducing it at Austrian ski resorts. Pricing was a key differentiator, with Red Bull positioned as a premium drink and Krating Daeng as a lower cost item. In many countries, both drinks are available, dominating both ends of the price spectrum. In 1992, the product expanded to Hungary and Slovenia. It entered the United States via California in 1997 and the Middle East in 2000. In 2008, Forbes magazine listed both Chaleo and Mateschitz as the 250th richest people in the world with an estimated net worth of US$4 billion. Red Bull GmbH is headquartered in Fuschl am See, an Austrian village of about 1,500 inhabitants near Salzburg. The company is 51 percent controlled by the Yoovidhya family who, for technical reasons, own the trademark in Europe and the US. In 1995, Krating Daeng authorized its drink. labelled as Red Bull, to be sold in China. Since 2014, the Austrian Red Bull (carbonated) has also been exported to China. This has created confusion since both drinks use the same brand name, in both English and Chinese. Similarly, in Southeast Asia, Red Bull and Krating Daeng are often confused as both use the Red Bull name in their packaging, although they are two separate products aimed at different markets. The main difference is that Red Bull comes in a tall blue and silver can while the Thailand Red Bull, or Krating Daeng, is in a smaller gold can. The two drinks also differ in terms of taste—Red Bull has less sugar and is carbonated. The flavouring used for Red Bull is still produced in Bangkok and exported worldwide. Depending on the country Red Bull contains caffeine, taurine, B vitamins (B3, B5, B6, B12) and simple sugars (sucrose and glucose) in a buffer solution of carbonated water, baking soda and magnesium carbonate. To produce Red Bull Sugarfree, sugars sucrose and glucose have been replaced by the sweeteners acesulfame K and aspartame/sucralose. Red Bull identifies its flavors as "editions." Several of these flavors have been rebranded for special events (the special grapefruit flavor, for example, has been branded as the "Bull" Edition, the "Red Italian" Edition, and the "F1 Edition"). Claims about the drink's effects and performance have been challenged on various occasions, with the UK's Advertising Standards Authority imposing advertising restrictions in 2001 in response to complaints recorded as early as 1997. Energy drinks have the effects that caffeine and sugar provide, but experts still argue about the possible effects of the other ingredients. Most of the effects of energy drinks on cognitive performance, such as increased attention and reaction speed, are primarily due to the presence of caffeine. There is evidence that energy drinks can increase mental and athletic performance. 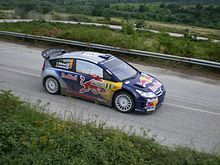 Performance during prolonged driving is increased after consumption of Red Bull. Other tests for physical performance showed results such as increased endurance and power. Red Bull energy drink increased upper body muscle endurance during repeated Wingate tests in young healthy adults. Excessive or repeated consumption of energy drinks can lead to cardiac and psychiatric conditions. The European Food Safety Authority (EFSA) concluded that exposure to taurine and glucuronolactone at the levels presently used in energy drinks is not a safety concern. In a separate analysis, they also concluded that there is insufficient evidence to support a number of commercial health claims about taurine. A review published in 2008 found no documented reports of negative or positive health effects associated with the amount of taurine used in energy drinks, including Red Bull. The review also states that though the caffeine and sugar levels in the energy drink are comparable to those present in coffee and fruit juice respectively, these levels have been shown to cause adverse health effects. In its scientific opinion on the safety of caffeine of 2015, the EFSA concluded that "consumption of other constituents of energy drinks at concentrations commonly present in such beverages would not affect the safety of single doses of caffeine up to 200 mg." Also, the consumption of alcohol, leading to a blood alcohol content of about 0.08%, would, according to the EFSA, not affect the safety of single doses of caffeine up to 200 mg. Up to these levels of intake, caffeine is unlikely to mask the subjective perception of alcohol intoxication. Habitual use of caffeine up to 400 mg per day does not. According to SAMHSA, "the number of emergency department (ED) visits" among people over age 12 related to energy drinks doubled between 2007 and 2011 in the US (from 10,068 to 20,783). The caffeine content of a single can of Red Bull is 80 mg/250 ml (32 mg/100 ml). This is about the same as one cup of coffee, or slightly less depending on the brewing method. The actual caffeine level in Red Bull can vary depending on country, as some countries have legal restrictions on how much caffeine is allowed in drinks. As is the case with other caffeinated beverages, Red Bull drinkers may experience adverse effects as a result of overuse. Excessive consumption may induce mild to moderate euphoria primarily caused by stimulant properties of caffeine and may also induce agitation, anxiety, irritability and insomnia. Authorities in France, Denmark, and Norway initially kept Red Bull from being sold domestically. However, as of 2014[update], it is on sale in all 28 member states of the European Union and in more than 167 countries around the world. The French food safety agency was concerned about taurine. A Red Bull drink that did not contain taurine was introduced. The French refusal of market approval was challenged by the European Commission, and partially upheld by the European Court of Justice in 2004. The French food safety agency relented in 2008, because it was unable to prove a definite health risk, taurine-related or not. In 2012, the Kuwaiti Ministry of Commerce banned Red Bull for people under 16 after it had allegedly caused heart attacks for a 16-year-old and a 21-year-old national squash team player. In 2013, Red Bull told the Redwell Brewery, a Norfolk micro brewery, to change its name or face legal action, because it sounded too similar to Red Bull. The eight-man brewery in Norwich was told its name could "confuse" customers and "tarnish" its trademark. The two companies reached a settlement permitting Redwell to continue using its name. In 2014, Red Bull faced a US$13 million settlement addressing two consumer class action lawsuits in the United States District Court for the Southern District of New York. The listed plaintiffs were Benjamin Careathers, David Wolf, and Miguel Almarez who sued the company for Red Bull's marketing and labeling, claiming that the company violated "express warranty and unjust enrichment" since their products were first launched by claiming performance-enhancing benefits from the drink's ingredients which were not substantiated by scientific studies. The court hearing took place the morning of 1 May 2015 in an attempt to determine approval for the settlement. Customers that submitted claims then have the opportunity to receive a US$10 cash reimbursement or product option of US$15 in Red Bull products within 150 days of the approved appeals. Contrary to false reports from some news outlets, the lawsuit was not about the drink failing to give the consumer actual wings. Red Bull's international marketing campaign targets young men mostly with extreme sports. 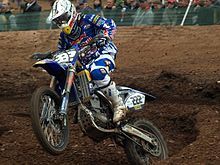 These range from mountain biking, BMX, motocross, windsurfing, snowboarding, skateboarding, kayaking, rowing, wakeboarding, cliff-diving, parkour, surfing, skating, freestyle motocross, rallycross, Formula 1 racing, NASCAR racing, to breakdancing. Red Bull uses music and videogames, and has enlisted celebrities, such as Eminem (sponsoring the Red Bull "EmSee Battle Rap championships"). It hosts events like art shows and the "Red Bull Flugtag" (German for "flight day" or "flying day"). Red Bull owns football teams, with clubs in Austria, Germany, the United States, and Brazil featuring the Red Bull trademark in their names. By associating the drink's image with these activities, the company seeks to promote a "cool" public image and raise brand power. The energy drink has created a market for over 150 related types of products. In the PlayStation 3's social gaming platform, PlayStation Home, Red Bull developed its own in-game island, specifically advertising its energy drink and the Red Bull Air Race event (for which the space is named) released in January 2009. In late November 2009, Red Bull produced two new spaces, the Red Bull Illume space, and the Red Bull Beach space featuring the Red Bull Flugtag, both released on the same day. In January 2012, Red Bull released its first personal space called the "Red Bull House of Skate" featuring an indoor skate park. On the Apple App store Red Bull also has a few apps which include: RedBull.com, Red Bull TV, The Red Bulletin, RBMA Radio, Red Bull iFunk, Wings For Life- Selfie Run. As well as some games on the app store which are: Bike Unchained, Red Bull Kart Fighter 3, Red Bull Air Race The Game, Red Bull Racers. In 2010, the company enlisted Adrian Newey to design a prototype racing car, the Red Bull X2010, for the videogame Gran Turismo 5. The Red Bull House of Art is an art fellowship program that was launched by Red Bull. The program is held in multiple cities, most notably the Red Bull House of Art programs in Detroit, Michigan and São Paulo, Brazil, and the program typically consists of a three-month period during which time six to eight participants will create new artwork with the intent to display it in a final exhibition. During the fellowship the artists receive unlimited access to the galleries and a stipend for art supplies. The program has received criticism as being an "elaborate advertising scheme", as some of the artwork has been used in Red Bull advertising campaigns. Red Bull Racing—a Formula One team based in Milton Keynes, England, World Constructor's Championship winner of 2010, 2011, 2012 and 2013, and produced the car for the 2010, 2011, 2012 and 2013 F1 World Champion Sebastian Vettel. New York Red Bulls: a football franchise competing in Major League Soccer of the United States. Red Bull Sailing Team: an Extreme Sailing Series racing team. Team Red Bull: a Toyota racing team competing in the U.S.-based stock car racing competition NASCAR Red Bull Racing Team competed in NASCAR beginning in 2007. The team ceased operations after the Sprint Cup Series' 2011 season. Red Bull Holden Racing Team – a Supercars team run by Triple Eight Race Engineering, manufacturer of cars 1 and 97, driven by 7 time champion Jamie Whincup and 2016 champion Shane van Gisbergen – Red Bull had sponsored the team as Red Bull Racing Australia, from 2013 until 2017, when the team was given sole factory backing from Holden, rebranding as the Red Bull Holden Racing Team. Red Bull Racing Brasil, a Stock Car Brasil team, since 2007. Red Bull KTM Factory Racing, a team competing in MotoGP. Red Bull Ghana: was a Ghanaian professional football club located in Sogakope that played in the Poly Tank Division One League. Esports team OG Dota 2. The Citroën rally car, which won the manufacturers' title in 2008, 2009 and 2010. In 2009, Red Bull added mainstream sport athletes to its roster of endorsements, which also includes persons involved in non-sporting activities. Reggie Bush, US NFL athlete announced at the 2009 Super Bowl. Ryan Dungey American Supercross, Motocross rider for Red Bull KTM Factory Racing. Marvin Musquin French Supercross, Motocross rider for Red Bull KTM Factory Racing. Skijumpers Gregor Schlierenzauer, Thomas Morgenstern, Adam Małysz, and Andreas Goldberger, snowboarders Mark McMorris, Torah Bright and Nathan Johnstone, and skiers Kaya Turski, Lindsey Vonn, Axel Lund Svindal and Alexis Pinturault. Dion Phaneuf NHL defenseman, currently with the Los Angeles Kings. Young professional golfer Rickie Fowler. Drift racing driver "Mad" Mike Whiddett. Professional chess player Hikaru Nakamura. Street Fighter players Daigo Umehara, Masato "Bonchan" Takahashi, Darryl "Snake Eyez" Lewis, Olivier "Luffy" Hay, Adel "Big Bird" Anouche, and Tsunehiro "Gachikun" Kanamori. Red Bull Supernatural – A "backcountry boarding competition designed to challenge, then crown the best all-around snowboarder on the planet." Red Bull Ring, a motorsport circuit in Spielberg, Styria, Austria. Red Bull Arena (Leipzig), home stadium of German football club RB Leipzig. Red Bull Arena (New Jersey), home stadium of the American soccer club New York Red Bulls. Red Bull Arena (Salzburg), home stadium of Austrian football club FC Red Bull Salzburg. Hangar-7 (Salzburg), a multifunctional building with a collection of historical airplanes. Red Bull bridge, a recurring distinctly branded footbridge at race events such as the World Enduro Championship and Rally Deutschland. ^ "Who makes Red Bull? Red Bull Company - Origin & founder :: Energy Drink :: Red Bull USA". energydrink-us.redbull.com. Retrieved 27 November 2018. ^ Burt Helm (4 January 2005). "Energy Drinks Build Their Buzz". BloombergBusinessweek. BLOOMBERG L.P. Retrieved 19 August 2012. ^ Red Bull (2012). "Company Figures". Red Bull. Red Bull. Retrieved 19 August 2012. ^ "Red Bull the company – Who makes Red Bull? Red Bull Origin :: Energy Drink :: Red Bull". Energydrink.redbull.com. Retrieved 13 November 2013. ^ Roll, Martin (17 October 2005). Asian Brand Strategy: How Asia Builds Strong Brands. Springer. p. 199. ISBN 9780230513068. Retrieved 24 September 2012. ^ Cheryl Tay (8 April 2011). "Former F1 Driver David Coulthard Thrilled Shoppers Along Bukit Bintang in Red Bull Racings Show Car Run". Va Va Vroom. Cheryl Tay Pte Ltd. Archived from the original on 8 January 2012. Retrieved 27 July 2012. ^ Lazare, Lewis (28 February 2013). "Red Bull introduces new flavors". American CIty Business Journals. Retrieved 6 May 2018. ^ "Company". Red Bull. Archived from the original on 1 February 2013. Retrieved 2 April 2011. ^ Pennay A, Lubman DI, Miller P (2011). "Combining energy drinks and alcohol" (PDF). Retrieved 12 August 2015. ^ a b Sanchis-Gomar F, Pareja-Galeano H, Cervellin G, Lippi G, Earnest CP (May 2015). "Energy drink overconsumption in adolescents: implications for arrhythmias and other cardiovascular events". The Canadian Journal of Cardiology. 31 (5): 572–5. doi:10.1016/j.cjca.2014.12.019. hdl:11268/3906. PMID 25818530. ^ a b Petit A, Karila L, Lejoyeux M (March 2015). "[Abuse of energy drinks: does it pose a risk?]". Presse Médicale. 44 (3): 261–70. doi:10.1016/j.lpm.2014.07.029. PMID 25622514. ^ a b c "Scientific Opinion on the safety of caffeine | Europäische Behörde für Lebensmittelsicherheit". www.efsa.europa.eu. 27 May 2015. Retrieved 2 January 2016. ^ a b McLellan TM, Lieberman HR (December 2012). "Do energy drinks contain active components other than caffeine?". Nutrition Reviews. 70 (12): 730–44. doi:10.1111/j.1753-4887.2012.00525.x. PMID 23206286. ^ "Face value | Selling energy". Economist.com. 9 May 2002. Retrieved 22 June 2009. ^ Kerry A. Dolan (28 March 2005). "The Soda With Buzz". Forbes. Retrieved 20 June 2015. ^ a b c Nivatpumin, Chiratas; Treeraponpichit, Busrin (28 December 2015). "Red Bull still charging ahead". Bangkok Post. Retrieved 30 December 2015. ^ a b "Red Bull GmbH Company History". Funding Universe. Retrieved 12 October 2007. ^ Ligaya, Armina (12 May 2010). "Region abuzz over energy drinks". The National. p. Business section, pp. 1, 6. Retrieved 13 May 2010. ^ "The World's Billionaires". Forbes.com. 11 February 2008. Retrieved 22 June 2009. ^ "Red Bull Ingredients :: Energy Drink :: Red Bull". Red Bull. Retrieved 4 May 2012. ^ "Caffeine in Red Bull". www.caffeineinformer.com. Retrieved 29 December 2017. ^ "Sweeteners in Red Bull zero sugar? :: Energy drink sugar free". Red Bull. Retrieved 24 September 2012. ^ "HEALTH | Energy drink claims rejected". BBC News. 24 January 2001. Retrieved 22 June 2009. ^ a b van den Eynde F, van Baelen PC, Portzky M, Audenaert K (2008). "[The effects of energy drinks on cognitive performance]". Tijdschrift voor Psychiatrie. 50 (5): 273–81. PMID 18470842. ^ Alford C, Cox H, Wescott R (1 January 2001). "The effects of red bull energy drink on human performance and mood". Amino Acids. 21 (2): 139–50. doi:10.1007/s007260170021. PMID 11665810. ^ "Tijdschrift voor Psychiatrie - Author index: Baelen, P.C. van". 21 December 2008. Archived from the original on 21 December 2008. Retrieved 2 February 2016. ^ a b Mets MA, Ketzer S, Blom C, van Gerven MH, van Willigenburg GM, Olivier B, Verster JC (April 2011). "Positive effects of Red Bull® Energy Drink on driving performance during prolonged driving". Psychopharmacology. 214 (3): 737–45. doi:10.1007/s00213-010-2078-2. PMC 3053448. PMID 21063868. ^ Baum M, Weiss M (1 January 2001). "The influence of a taurine containing drink on cardiac parameters before and after exercise measured by echocardiography". Amino Acids. 20 (1): 75–82. doi:10.1007/s007260170067. PMID 11310932. ^ Geiß KR, Jester I, Falke W, Hamm M, Waag KL (February 1994). "The effect of a taurine-containing drink on performance in 10 endurance-athletes". Amino Acids. 7 (1): 45–56. doi:10.1007/BF00808445. PMID 24185972. ^ Forbes SC, Candow DG, Little JP, Magnus C, Chilibeck PD (October 2007). "Effect of Red Bull energy drink on repeated Wingate cycle performance and bench-press muscle endurance". International Journal of Sport Nutrition and Exercise Metabolism. 17 (5): 433–44. doi:10.1123/ijsnem.17.5.433. PMID 18046053. ^ EFSA Panel on Food Additives and Nutrient Sources added to Food (2009). "The use of taurine and D-glucurono-γ-lactone as constituents of the so-called 'energy' drinks". The EFSA Journal. 935 (2): 1–31. doi:10.2903/j.efsa.2009.935. ^ Clauson KA, Shields KM, McQueen CE, Persad N (2008). "Safety issues associated with commercially available energy drinks". Journal of the American Pharmacists Association. 48 (3): e55–63, quiz e64–7. doi:10.1331/JAPhA.2008.07055. PMID 18595815. ^ "1 in 10 Energy Drink-Related Emergency Department Visits Results in Hospitalization" (PDF). Substance Abuse and Mental Health Services Administration. Retrieved 9 March 2017. ^ "Red Bull caffeine beverage review". About.com. 22 October 2009. Archived from the original on 15 April 2012. Retrieved 29 May 2012. ^ "Nutrition Facts and Analysis for Energy drink, RED BULL, with added caffeine, niacin, pantothenic acid, vitamins B6 and B12". Condé Nast. Retrieved 29 May 2012. ^ Alford C, Cox H, Wescott R (2001). "The effects of red bull energy drink on human performance and mood". Amino Acids. 21 (2): 139–50. doi:10.1007/s007260170021. PMID 11665810. ^ Richards G, Smith AP (June 2016). "A Review of Energy Drinks and Mental Health, with a Focus on Stress, Anxiety, and Depression". Journal of Caffeine Research. 6 (2): 49–63. doi:10.1089/jcr.2015.0033. PMC 4892220. PMID 27274415. ^ "It's Your Health – Caffeine". Health Canada. 13 April 2012. Retrieved 24 November 2014. ^ a b Winston AP (2005). "Neuropsychiatric effects of caffeine". Advances in Psychiatric Treatment. 11 (6): 432–439. doi:10.1192/apt.11.6.432. ^ Jin MJ, Yoon CH, Ko HJ, Kim HM, Kim AS, Moon HN, Jung SP (March 2016). "The Relationship of Caffeine Intake with Depression, Anxiety, Stress, and Sleep in Korean Adolescents". Korean Journal of Family Medicine. 37 (2): 111–6. doi:10.4082/kjfm.2016.37.2.111. PMC 4826990. PMID 27073610. ^ Warning: Energy Drinks Contain Caffeine by Allison Aubrey. Morning Edition, National Public Radio, 24 September 2008. ^ a b Frith, Maxine (7 February 2004). "European court backs ban on Red Bull over health concerns". The Independent. London. Retrieved 22 November 2010. ^ "France ends 12-year ban on energy drink Red Bull". Paris. Reuters. 15 July 2008. Retrieved 22 November 2010. ^ Habib Toumi, Bureau Chief (16 May 2013). "Kuwaiti player dies after taking energy drinks". GulfNews. Retrieved 5 July 2014. ^ "KUNA : Decisions regulating sale of energy drinks issued – Economics – 21/10/2012". Kuwait News Agency (KUNA). 21 October 2012. Retrieved 5 July 2014. ^ كونا : وزارة التجارة تصدر قرارا ينظم انتاج وعرض وبيع مشروبات الطاقة – التجارة – 21 October 2012 (in Arabic). Kuwait News Agency (KUNA). 21 October 2012. Retrieved 5 July 2014. ^ "التجارة": مشروبات الطاقة ممنوعة لمن دون الـ 16 (in Arabic). Al-Qabas newspaper. 21 October 2012. Archived from the original on 8 July 2014. Retrieved 5 July 2014. ^ "Red Bull and a crisis in Kuwait that hasn't hit the headlines". Alex of Arabia's Blog. 20 April 2013. Retrieved 5 July 2014. ^ "Red Bull Kuwait Loses Millions". Q8Critic. 24 October 2012. Archived from the original on 25 June 2013. Retrieved 28 June 2013. ^ "Red Bull pursues Redwell brewery in Norwich over name". BBC News. 14 August 2013. Retrieved 13 November 2013. ^ "Red Bull ends dispute with Redwell brewery in Norwich". BBC News. 14 August 2013. Retrieved 13 November 2013. ^ "Red Bull Puts Up $13M To Settle False Advertising Suit – Law360". www.law360.com. Retrieved 8 March 2017. ^ "Red Bull Agrees to $13M False Advertising Class Action Settlement". Top Class Actions. 4 August 2014. Retrieved 8 March 2017. ^ "Red Bull to Pay $13 Million". bevnet.com. Law360. 5 August 2014. Retrieved 21 October 2014. ^ "Drink Red Bull? You may have $10 coming to you". cbsnews.com. 9 October 2014. Retrieved 16 February 2015. ^ "So Red Bull doesn't actually 'give you wings'". Bbc.co.uk. 9 October 2014. Retrieved 3 November 2014. ^ O’Reilly, Laura (8 October 2014). "Fact check: Red Bull does (not) give you wings". Snopes. Retrieved 10 June 2018. ^ "Energy drink claims rejected". 24 January 2001. ^ sean (5 February 2017). "Red Bull Rampage Recap". Mountain Bike Action Magazine. Retrieved 8 March 2017. ^ "Drew Bezanson wins Red Bull Framed Reactions BMX Park comp". XGames. Retrieved 8 March 2017. ^ "2017 Red Bull KTM | Team Intro | Transworld Motocross". Transworld Motocross. 18 December 2016. Retrieved 8 March 2017. ^ (PWA), Professional Windsurfing Association. "Red Bull Storm Chase". PWA World Tour. Retrieved 8 March 2017. ^ "Red Bull Snowboarding | Snowboarder Magazine". Snowboarder Magazine. Retrieved 8 March 2017. ^ "red bull skateboarding | TransWorld SKATEboarding". TransWorld SKATEboarding. Retrieved 8 March 2017. ^ "Chasing Niagara Falls in a Kayak | VICE Sports". VICE Sports. Retrieved 8 March 2017. ^ "Red Bull High Stakes – Overview". www.regattacentral.com. Retrieved 8 March 2017. ^ "Red Bull Wake of Steel 2016". Wakeboarding Magazine. Retrieved 8 March 2017. ^ "Red Bull Cliff Diving World Series Announces 2017 Schedule". Archived from the original on 9 March 2017. Retrieved 8 March 2017. ^ Kolasa-Sikiaridi, Kerry. "...Wins Parkour Red Bull Art of Motion in Santorini (video) | GreekReporter.com". Retrieved 8 March 2017. ^ "Red Bull Crashed Ice Championship in Saint Paul, MN – Visit Saint Paul". www.visitsaintpaul.com. Archived from the original on 9 March 2017. Retrieved 8 March 2017. ^ "Real-Time Data Tech Dazzles Red Bull X-Fighters Fans". iQ by Intel. 22 June 2016. Retrieved 8 March 2017. ^ GRC. "Red Bull Global Rallycross New England set for June". www.racer.com. Archived from the original on 8 March 2017. Retrieved 8 March 2017. ^ "Red Bull "positive" RB13 can challenge Mercedes in F1 2017". Motorsport.com. Retrieved 8 March 2017. ^ "Archrival | Red Bull Racing in NASCAR". Archrival. Retrieved 8 March 2017. ^ "Redbull Flying Bach tour brings Bach and breakdancing to Dallas in 2017". AXS. Retrieved 8 March 2017. ^ Pajot, S. (3 November 2011). "Calling Battle Rappers! Enter Red Bull EmSee Miami and Win a Trip to the Finals in Atlanta". Miami New Times. Retrieved 8 March 2017. ^ "Red Bull's high-flying Flugtag competition to return to Nashville". The Tennessean. Retrieved 8 March 2017. ^ "Austria – FC Salzburg – Results, fixtures, squad, statistics, photos, videos and news – Soccerway". us.soccerway.com. Retrieved 8 March 2017. ^ a b "Analysis | RB Leipzig's Bundesliga debut is like a fairy tale in which the bad guys are winning". Washington Post. Retrieved 8 March 2017. ^ "Brazil – Red Bull Brasil – Results, fixtures, squad, statistics, photos, videos and news – Soccerway". us.soccerway.com. Retrieved 8 March 2017. ^ "RED BULL HISTORY". speedace.info. Electrick Publications. Retrieved 27 July 2012. ^ "Red Bull becomes first brand on PlayStation Home". Retrieved 8 March 2017. ^ Fahey, Mike. "Red Bull Gives PlayStation Home New Things To Do". Kotaku. Archived from the original on 4 July 2018. Retrieved 8 March 2017. ^ "Red Bull House of Skate". YourPSHome.net. Retrieved 8 March 2017. ^ "iTunes – Browse the top free apps on the App Store – Apple". Apple. Retrieved 11 February 2016. ^ "GTVault – Gran Turismo 5Setup for". www.gtvault.com. Retrieved 8 March 2017. ^ Abbey-Lambertz, Kate (7 August 2013). "Red Bull House of Art Bolsters Detroit Scene By Giving Artists on the Verge A Leg Up (VIDEO)". Huffington Post. Retrieved 24 January 2015. ^ Hammerstein, BJ. "Detroit artist star of new Red Bull ad". Detroit Free Press. Retrieved 24 January 2015. ^ Rigby, Claire. "Red Bull Station opens up downtown". Time Out Brazil. Retrieved 24 January 2015. ^ DeVito, Lee. "Meet the creative minds behind the Red Bull House of Art's Cycle 8". Metro Times. Retrieved 24 January 2015. ^ Trevino, Jessica J. "Meet the 6 local artists featured in the Red Bull House of Art exhibit". Detroit Free Press. Retrieved 24 January 2015. ^ DeVito, Lee. "Red Bull House of Art". MetroTimes. Retrieved 24 January 2015. ^ Lacy, Eric. "Grammys 2014: Watch Detroit Red Bull House of Art 'City of Soldiers' commercial aired during show". MLive. Retrieved 24 January 2015. ^ "Holden commits to Supercars | Supercars". Supercars. Retrieved 15 October 2017. ^ "OG and the rise of player centred teams". redbull.com. Retrieved 2 August 2017. ^ "Reggie Bush Goes to Red Bull – ESPN The Magazine". Sports.espn.go.com. 30 January 2009. Retrieved 22 June 2009. ^ "Hikaru Nakamura Always try to win at all costs". ^ "US No. 1 Nakamura Signs with Red Bull". ^ Womack, Barrett (16 February 2016). "How Leffen Will Take Over the World". Red Bull eSports. ^ Walker, Ian (22 July 2015). "Red Bull Gives Darryl "Snake Eyez" Lewis Wings". Shoryuken.com. Retrieved 26 November 2016. ^ "Adel "Big Bird" Anouche is the latest Street Fighter V player to join Red Bull's Athlete program". Shoryuken. 29 January 2018. Retrieved 16 December 2018. ^ "Tsunehiro "Gachikun" Kanamori becomes a Red Bull Athlete". Shoryuken. 7 November 2018. Retrieved 16 December 2018. ^ Origen staff (14 May 2015). "xPeke becomes a Red Bull Athlete". Archived from the original on 21 June 2018. Retrieved 30 June 2017. ^ Galaflow (15 May 2015). "xPeke ist der erste RedBull-Athlet!". Summoners-Inn.de (in German). Retrieved 30 June 2017. ^ "Breaking Down The Elite Eight :: Red Bull Esports". Red Bull. Retrieved 21 June 2013. ^ "Red Bull Cold Rush 2012 :: Red Bull". Red Bull. Retrieved 17 April 2012. ^ "Red Bull Dolomitenmann |". Dolomitenmann.com. 3 April 2013. Retrieved 28 July 2013. ^ "Red Bull Elements". Red Bull Aventure. Retrieved 13 November 2013. ^ "Red Bull Storm Chase". Red Bull. Retrieved 9 February 2014. 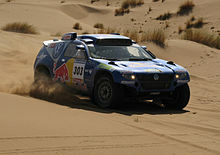 ^ "Red Bull Supernatural Event Web Page". Retrieved 22 August 2012. ^ "Red Bull Soapbox Race". Archived from the original on 7 February 2013. Retrieved 7 February 2013. ^ "Red Bull Unleashed 2015". Red Bull. Retrieved 17 November 2018. ^ "2014 World Bridge Series – World Bridge Federation". Worldbridge.org. 24 July 2013. Retrieved 10 June 2014.